Last Friday I did one of my favorite things, went to get my hair done. This time I was invited to go back to salon change Rush, who have recently opened their 50th salon on Earls Court Road. Before Christmas I went to visit the salon at King’s Cross, which was a very enjoyable experience so I was more than happy to be able to go back. This time around I was getting half a head of highlights plus a cut and blow dry. 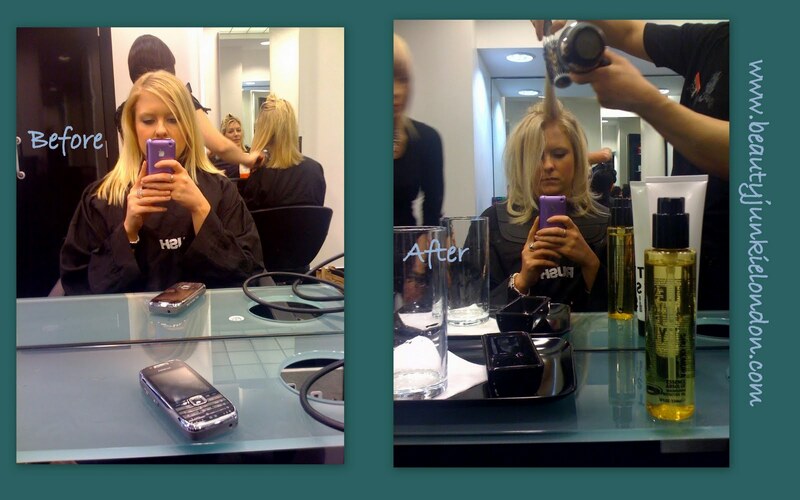 Below are some ever-so-professional i-phone/mirror pictures, before and after (the after is part way through the blow dry part…) Gives a bit of an idea of the slight change in shade from golden to slightly cooler. On the ‘after’ side, there is a bottle of the Shu Umuera treatment oil that was used during the session, I am really keen to get my hands on this and have a play myself – I was impressed with how soft and lovely my hair felt and think this could do it some good. The salon experience was really good, in fact I would actually say the Earls Court Road salon was more impressive than the King’s Cross one. This is about 95% based on the fact that this new salon had made the sink/hair washing area into a far more pampering, luxurious experience with the added benefit of Shu Umuera treatments being available. My overall impression of this salon is that it had a bit more of a luxury factor than the average Rush salon. I think that Rush salons are really lovely, but I would say that they are very functional salons. But with the new addition of the Shu Umuera pampering element (not just at this Rush salon, also at others) it takes them a bit further to the point where I would chose to go to Rush salons for both the ‘chore’ (not that it’s ever a chore, but I can’t think of a better word) of getting hair done, and for something a bit extra luxurious. The head massage/hair wash and treatment was undoubtedly the highlight. My hairdresser, Glebe was great – sat and listened whilst I explained and showed him pictures of the style and colour I wanted and talked through which elements would and wouldn’t work. I discussed the fact that I was interested in looking into getting a loose perm to get ‘natural’ beachy waves – he has completely talked me out of this, as I already have bleach in my hair for the highlights he said it would simply cause too much damage that it wouldn’t be worth it. Plus he also explained how the perming treatment really doesn’t just make hair naturally wavy – it takes a lot of maintenance and styling to achieve the look I wish I had naturally. So for now I am sticking with what I have (plus a few highlights). I really appreciate it when a hairdresser manages to both listen, do as you ask yet also offer advice where appropriate. I also really appreciate it when hairdressers let you just sit there and chill out and recognise that small talk isn’t everyone’s cup of tea – it’s nice to be allowed to just read a magazine or relax rather than talk about where you are going on holiday this year…might just be me. The colour I went for was a bit of a cooler shade than I normally choose, a paler ash blonde. I really like the colour, it feels brighter and more appropriate for spring. Although I was a little worried when I was looking in the mirror on the tube that some of it looked so pale blonde that it almost crossed into ‘gray’ territory. But I have been assured it was just bad lighting and it doesn’t really look like that… phew! So overall, a very pleasant pampering experience and I would go back. If you are thinking of going along then make sure you check out the Rush website, they always have fantastic deals on and at the moment they are offering 50% off your first visit – just click HERE and follow the instructions. I was invited to visit the Rush salon free of charge for review purposes. All reviews are honest and impartial, regardless of source. Previous Post What do you buy with you Boots No7/Ruby & Millie £5 vouchers…? love the after shot. the slight waviness definitely agrees with you. Looks great, very springlike! I agree with Dani about it being good to find a stylist who actually listens and gives good advice – unfortunatly seems to be quite rare in a lot of salons, so this is probably one to hold on to!! RUSH London is a company under going full investigation in the journalist world, due to it’s running’s the way the company treats it’s clientele and staff is just as numbers,their pay strategy with staff is ill founded as many of the staff are under paid or otherwise not paid at all,staff are not allowed to voice queries of the way they are being treated,and are just there to make money for the company and the company solely and have no way of becoming part of the company if they are seen to have a voice. The clients secondly are also treated as just numbers and all that matters ids that the stylist is to take the money from your pocket for you hair cut color,whilst also being pushed to buy every product going use every service in the salon possible i.e treatments e.c.t and at the same time your are made to give every detail possibly so as to be hassled for the next 6mounths with messages emails and more to try and get you to return again to their checkout service hair salon. RUSH London give the industry in full a bad name. If you want to give this company more of their dirt money and spend your hard earned cash on a visit to be treated only as a cash machine for them then have your hair done here or even better go work for the company! I actually went online to write a review for RUSH hair as a customer and to say my experience in their saloon at Earl’s Court. I am local and I will never go back. They were overpriced (charged 40 pounds for a wash / blow dry). I wanted my hair in a casual semi – pony tail, she wanted to charge me 50 pounds more for that because according to their catalogue this is a ”hair up”. The staff were not that friendly and a bit arrogant especially after I declined their suggestion to pay for 90 pounds! !!! The end result was not even professional. We had a formal occasion on that evening and my friends did not believe I actually went to the hairdresser!!! Very disappointing service, all in all … Not worth the money and the reputation. Luckily after this experience I discovered a little little hidden hairdressers in the are, who would charge me only 27 pounds (almost 35% off their price) are friendly and professional. I also wanted to write a review of how terrible my experience at Rush was. I have been given the worst hair cut of my life and now just have to wear my hair up every day until all the chunks grow out a bit. I’m actually embarrassed about how I look and one should never feel that way after going tithes hairdresser. The girl who did my hair had no clue what she was doing. Very young and inexperienced. I will never go back there. Came into the salon last week, had my hair cut and blow dried by Rheannon. As a very fussy customer, i know I’m hard to please and I’ve suffered many upsetting disasters. Rheannon was attentive, understanding and very friendly. She made me feel at ease straight away and nothing was too much trouble. I was advised about cuts that would suit my face shape, she taught me how to look after and style my hair at home and gave me advice on colours to cheer me up for the winter. Charlotte Rose, Fussy but feeling FABULOUS! !